Geert Omloop (born 12 February 1974) is a Belgian professional road racing cyclist who was born in Herentals. He currently races for UCI Continental team Palmans-Cras and is also the cousin of cyclist Wim Omloop and the son of Marcel Omloop. He turned professional in 1997 having raced for several professional teams in 1995 and 1996 as a trainee. 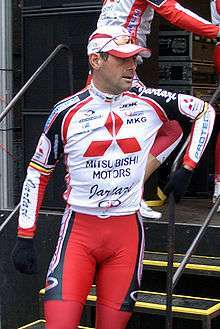 He became the Belgian National Road Race Champion in 2003, but lost the title in 2004 when he finished second. ↑ "Gert Omloop". Mitsubishi - Jartazi.